Tour pros are meticulous about getting their equipment tailored down to the smallest detail. Take wedges -- the scoring clubs. Aside from having a wedge design that is pleasing to the eye, tour players are looking to match their wedges to things like their swing types, turf conditions, and desired feel at impact. They are very particular about what they want. 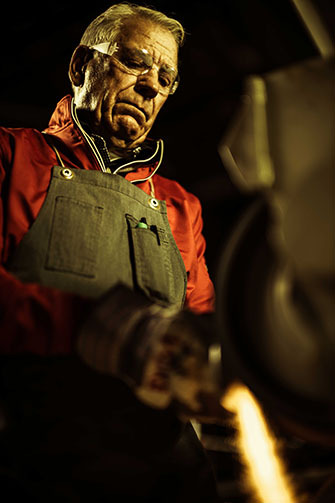 That's where Titleist master wedge craftsman Bob Vokey comes in. Vokey spends time with the best players in the world, gaining understanding of their wants and needs, and then heads to the tour truck and hits the grinding wheel. For those not on Tour, such personal specification has never been an option -- until now. Vokey himself has introduced his new HandGround program on Vokey.com, where Vokey and two of his proteges will offer tour-level customizations from a new workspace inside Titleist Headquarters in Carlsbad, Calif. The HandGround option is currently available on all Vokey SM7 Raw wedge models. 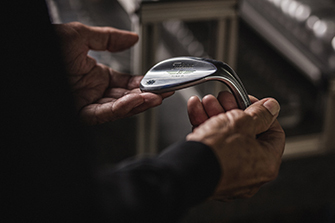 Said Vokey, "This takes me back to my roots - one player at a time, one wedge at a time, crafting the sole to the player's exact specifications." Are you playing on firm conditions, or have a shallow swing type? A pre-worn leading edge can reduce effective bounce. Looking for a better feel through the ground at impact? Grind lines can be smoothed out. Concerned about the sole "catching" through the turf? Heel relief or trailing edge relief can be given. Are you particular about how your wedge sits behind the ball? The head shape can be altered in a variety of ways to give it a more pleasing look. A semi-square leading edge (where the leading edge is made parallel to the first groove) can help players with alignment. The top line can be thinned out to give the head a thinner appearance. Finally, a Vokey "tour grind" profile is offered, with rounded edges, a softer look, and a slightly smaller overall size. There will also be an option to alter specific grinds. For example, for those who want additional greenside versatility, the Vokey F Grind can be turned into an S Grind. Heel & trailing edge relief can allow the K Grind to perform more like a J Grind. Smoother grind lines allow the L Grind to become more like an A Grind. So if you are ready to tinker like a tour pro, HandGround wedges are now available on all SM7 Raw models through Vokey.com. SM7 Raw wedges – including BV Wings grip and 10-character stamping – start at $195. There is an additional $75 charge for HandGround services, with a maximum of two adjustments per wedge.